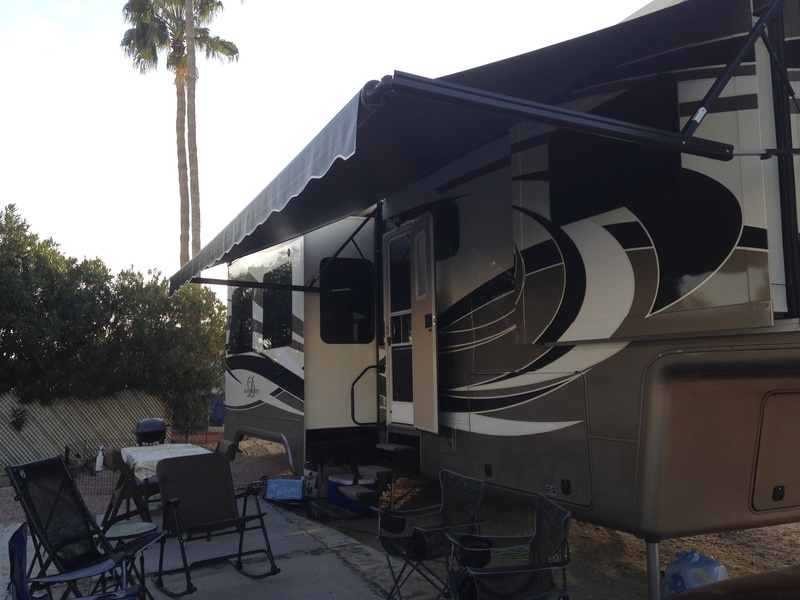 John made our park reservations over a month ago as the snowbirds start flocking toward Arizona this time of year and we needed a space for five weeks. The registration hostess presented us with a tote bag and name tags, and was so welcoming until she realized that we had KIDS. Apparently the reservationist failed to mention that this park is for persons 55+ and the park is ‘kid-friendly’ two weeks at a time. Our form clearly stated that we were traveling with kids and dogs. Furry friends welcome without length of stay restrictions. These 55+ folks may be on to something here. I digress. Fortunately, John convinced our hostess that we wouldn’t be breaking the park rules for kids at all. 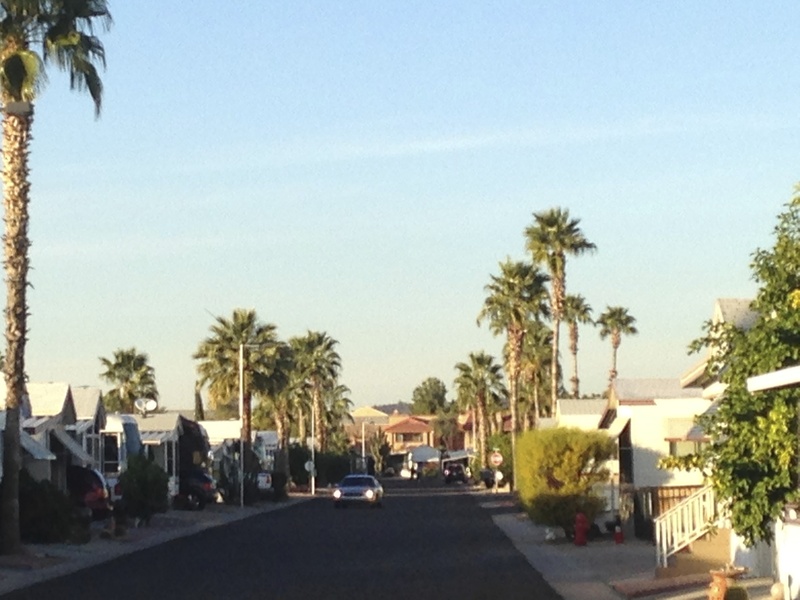 He explained: we’d stay in Phoenix for two weeks, then leave our rig at the site but vacate the park with our family, both furry and not, for a week in Las Vegas, and then return for two more weeks. That sufficed and she made an exception for us. With that detail out-of-the-way, the camp host, driving his golf cart, escorted us to our corner site and, using hand signals and vocal commands, assisted John in backing the fifth-wheel into place. John did great considering we’d had a pull-through site in Las Cruces and this was his first time backing 43’ into a space. 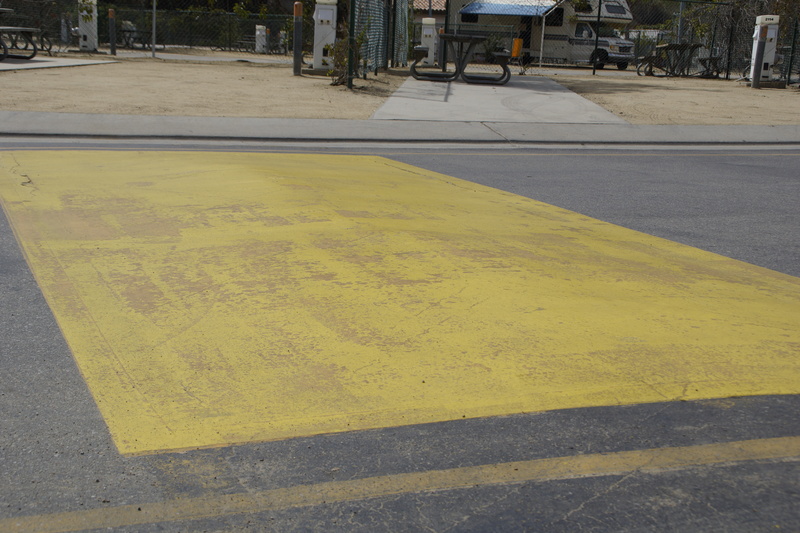 We had a nice concrete pad just outside our front door and adjacent parking space for our vehicles. It was perfect. The weather was perfect. The palm trees were perfect. The door unlocked on the first try. We got set up in no time and decided to watch the game at Chili’s since the antenna wasn’t so perfectly locating the game. After a Bronco victory clinching a super bowl appearance and a good night’s sleep, John got up on Monday morning and started contacting his local customers. Blake, with just one week until his first golf tournament, reserved his workout spot at Orange Theory, loaded his golf clubs into the Mini Cooper and set out to find a driving range. The kids dug out their math books, and I started organizing drawers and making a grocery list. Late that afternoon, we ventured over to the local Costco to fill up the back of the F-450 with the week’s groceries. Halfway through our shopping trip, John’s phone rang and his distressed response to the caller stopped me in my tracks. Within moments I was able to discern there had been an accident. 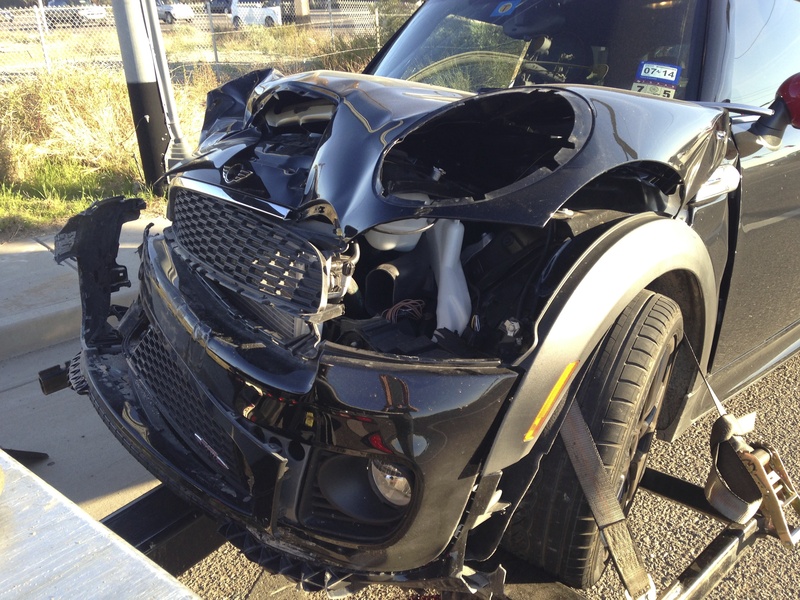 Blake had been in a car accident. I grabbed the phone from John’s ear. I needed to hear Blake’s voice. He was all right. The other driver, thankfully, was fine too. We quickly checked out from Costco and headed toward the scene of the accident. I’m so grateful for iPhone map technology and Blake’s ability to pin his location and text it to us. I jumped out of the truck before John came to a complete stop. 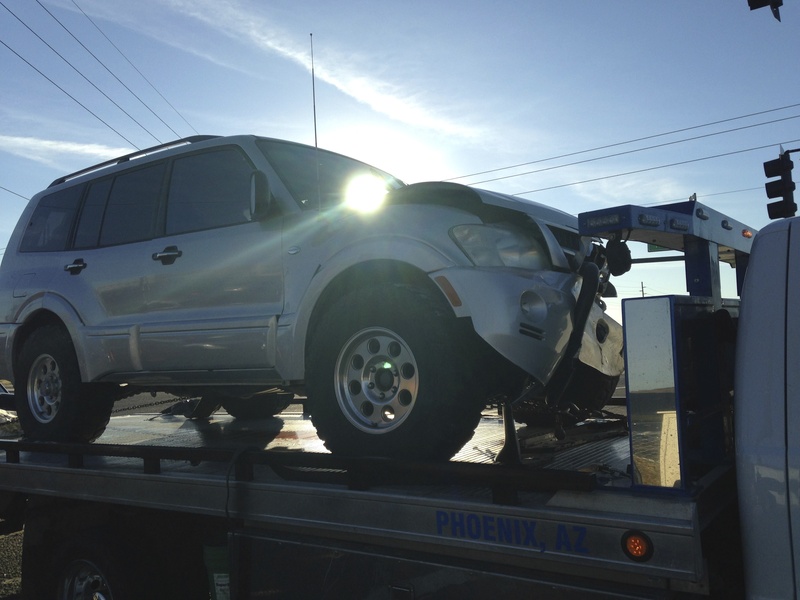 A tow truck driver was loading two banged up cars onto the towing flatbed. Two police cars, lights flashing, shielded the scene and redirected traffic through the intersection. Blake was sitting on the curb, hands over his face, bag of golf clubs resting beside him. When I got my arms around him, he kept apologizing. His first car accident. He thought he had a protected green arrow and made a left turn in front of a mid-sized SUV. Our embrace was long. He was okay, therefore, I was okay. 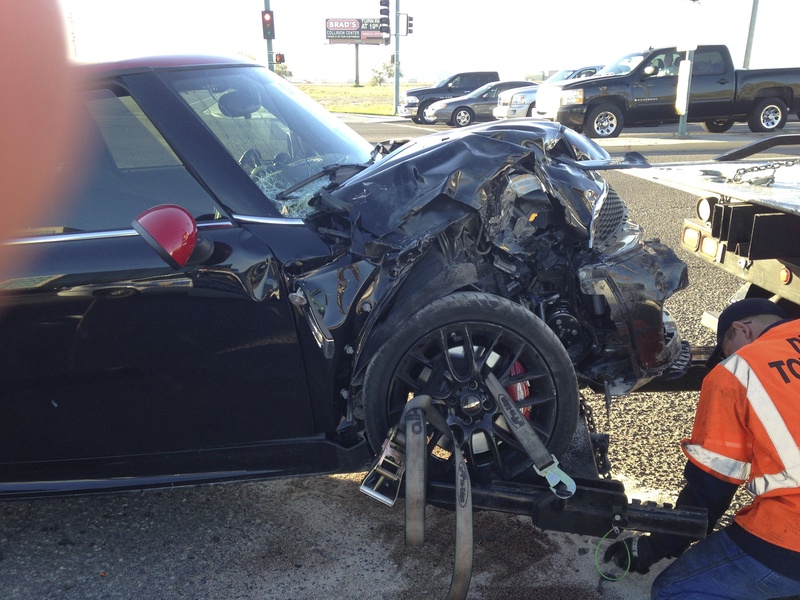 Visions of my car accidents as a young driver flooded my brain. I remember my parents telling me that the car damage didn’t matter; they only cared about me. I said those same words to Blake; that day and many that followed. 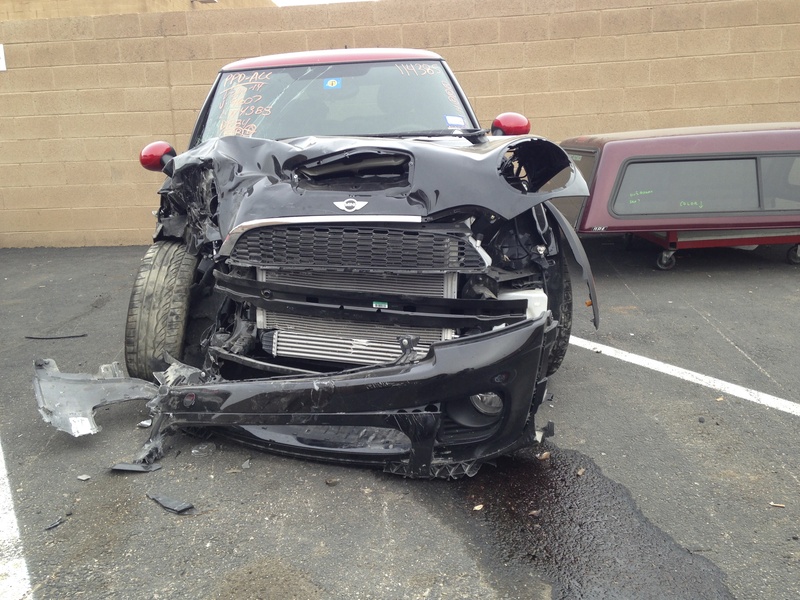 The insurance company deemed our brand new Mini Cooper a total loss. 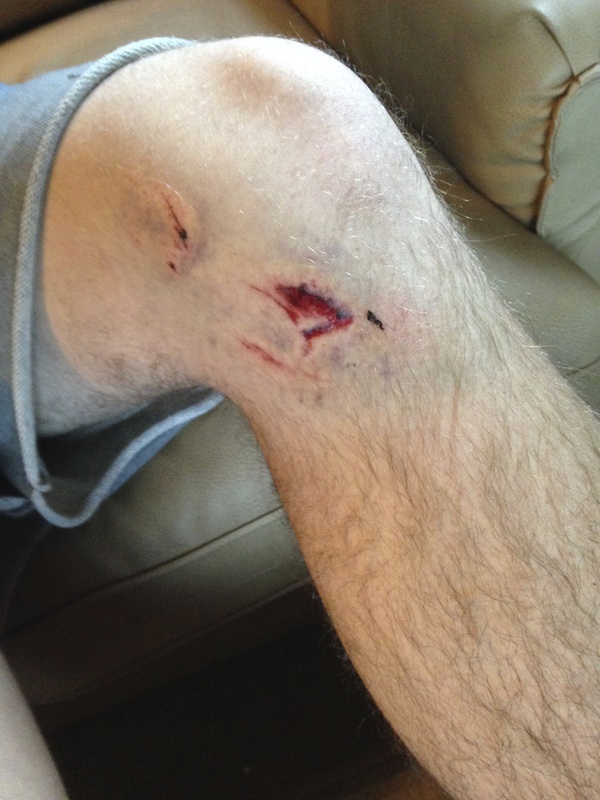 Blake’s left knee suffered a deep cut, swelling and bruising. His right toes were so swollen and sore he couldn’t bear weight on his foot. His golf clubs didn’t have a scratch. There would be no workouts at Orange Theory and there would be no golf tournaments. One week of icing the knee and foot turned into several weeks of no practice ending his tournament opportunities in Arizona. Our insurance company provided us a rental car for two weeks giving us some time to consider our options. Replacing a brand new car hadn’t been on our agenda and certainly not three days into our five month RV trip up the West Coast. For now, we decided to enjoy the Arizona sights. There were desert trails to explore, museums to see, and mules to ride at the Grand Canyon. 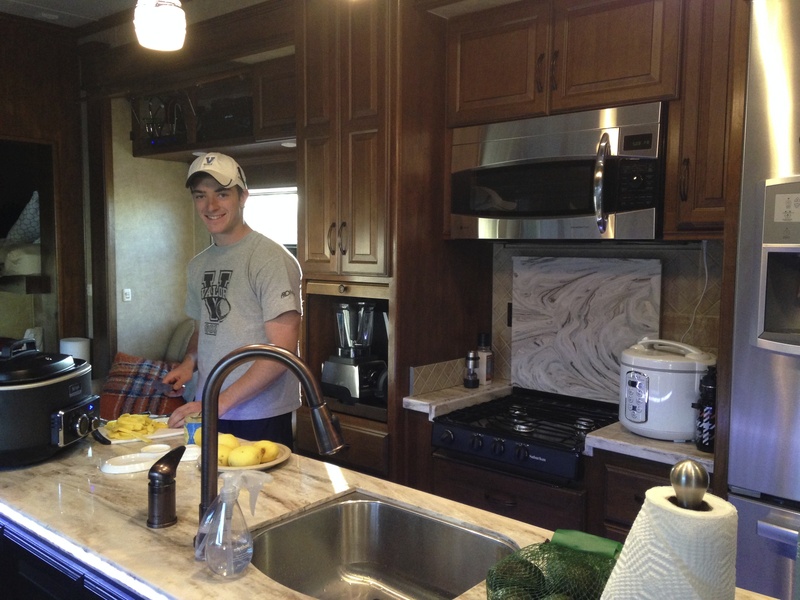 This entry was posted in Fifth-Wheel, God's perfect timing, Purpose, RV, RVing, Travel and tagged God's perfect timing, purpose, RV, Travel with kids by Natalie Lewis. Bookmark the permalink. I am *so* glad Blake is okay. What a miraculous blessing. Thank You, Lord, for looking out for Blake even in bummer circumstances. 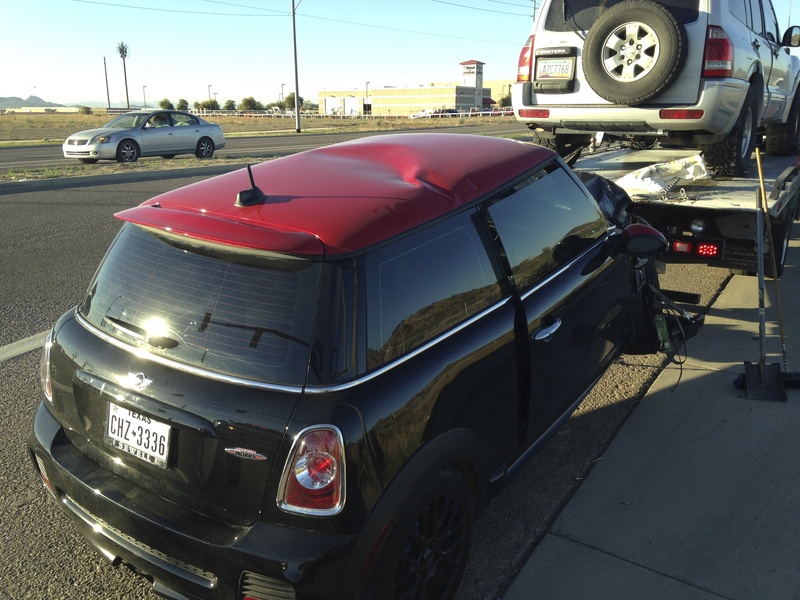 Also thankful the Mini gave its life for Blake. When I took delivery on my BMW, the guys in the service dept told me that’s what the car is designed to do. I thought it odd at the time… Now, looking at your photos, I get it!! Oh girlfriend, that car took it like a man. The cab of the car was in tact. Safety matters! So glad God directed his angels around that car. I’m so glad that your son was okay. How scary for all of you, but once again God showed you his love and protected him during this “bump” in the road. Natalie, what a roller coaster this adventure has turned into for you and your family! So happy and relieved to hear that Blake is alright. He is so blessed. Not because he walked away from what could have been serious injury, but because you are his mom. Your grace under fire and acceptance of what ever the Good Lord puts in your path, coupled with your constant love, not only comforted him, but showed him by example how best to deal with these incredible bumps in the road. Hugs to all and many blessings on your journey. Sandy, you continue to encourage and cheerlead me. Thank you. I needed to hear those words today. I admire you as a mom, wife, and woman. Wanna hear more about your move! Love ya lady.